No one on last year's SLU team was better than Grandy Glaze at the stuff that doesn't show up in box scores. ST. LOUIS — Ten games into a rebuilding season, much remains unknown about the Saint Louis Billikens. Coach Jim Crews continues to rely on a 12-man rotation that he says could change from game to game. Scoring can come from virtually anyone; five players already have led the team in scoring for one or more games. And at least for now, their leading rebounder is a guard, junior Ash Yacoubou. 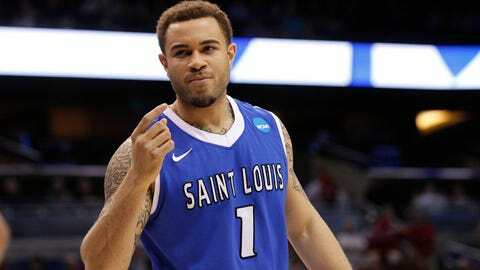 But for all the things they haven’t figured out at Chaifetz Arena, one has become quite obvious: The Billikens (6-4) miss senior forward Grandy Glaze, who has yet to play this season and remains out indefinitely because of a right shoulder injury. "It’s definitely hurt us," junior guard Austin McBroom said before Tuesday’s practice. "He’s a senior. He’s been through the process." Glaze’s absence hasn’t been felt so much in the numbers. He averaged only 3.8 points to go with 4.5 rebounds in 12.9 minutes per game last season. He started only the first six games before he began to come off the bench. Only twice after last Dec. 14 did he play more than 20 minutes in a game. Still, he was able to impact a game just about every time he stepped on the floor. No one on the team was better at the stuff that doesn’t show up in the box scores. Setting screens, blocking out on rebounds, helping on defense and other such lunch-pail chores have been Glaze’s specialty since he landed on campus from a Massachusetts prep school in 2011. "He’s really good at disrupting offenses," Crews said. "A lot of people go through their four man to get (their offense) from one side to another, or to get initiated into their offense. He was able to blow that up at times." Glaze also was the type of player who would sprint from defense to offense just to make the man assigned to guard him get caught on his heels. "He would run the floor and not that he would get buckets, but he would open up other (players) because he had great energy," Crews said. 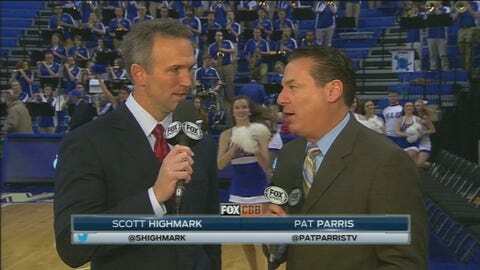 FOX Sports Midwest coverage of the Texas-Pan American-SLU game begins at 7 p.m. Wednesday. This year’s team could use the experience of a second senior to go with John Manning, too. The Billikens are playing six freshmen, including three — Brett Jolly, Milik Yarbrough and Austin Gillmann — on the inside. Though Jolly benefited from a year at prep school and Yarbrough boasts more heft than most freshmen, the Billikens have been hurt by a lack of toughness inside. They have owned a height advantage just about every game but still have been out-rebounded six times, including in all four losses. In their only blowout losses, to Wichita State and Mississippi State, the Billikens were out-boarded by 21 and 15, respectively. While Yarbrough has handled his own on rebounds, the 6-foot-9 Jolly and the 6-10 Gillmann are averaging just 3.3 rebounds combined. After dropping weight last season, Glaze had beefed up in the offseason because he knew he would be needed to provide an inside presence on the defensive side. Instead, he remains on the sideline still trying to make a difference. When a timeout is called, Glaze typically is the first one off the bench to put an arm around one of his young teammates and offer his insight. Lookin’ good! Check out our gallery of NCAA cheerleaders. "Even though he’s hurt, he’s still supporting us off the court and he’s still teaching guys that are on the court," McBroom said. "He’s definitely a big part of this team." Crews said he did not anticipate Glaze being sidelined for this long but at this point, he is not close to returning. If too much of the season passes before he is cleared to play, he could decide to wait till next year. He likely would have to transfer but, as long as he graduates in the spring, he would be eligible to play elsewhere without having to sit out. SLU, of course, is hoping it doesn’t come to that. For a young team lacking consistency, Glaze’s energy and experience would be a steady — and welcome — addition.